Why were Moses’ parents, Amran and Jochabed, not afraid of the Pharaoh and his commands? Read Hebrews 11:23. 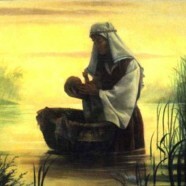 For more information about Moses’ early years read Acts 7:19-22 and Hebrews 11:23-27. God richly rewards Jochabed’s faith and places Moses in the most secure place in Egypt – the palace of the Pharaoh. He is not there as a slave either, but as a loved and trusted son of the Pharaoh’s daughter. He is trained in all of the learning of Egypt – the most scientifically advanced civilization of that day. In what ways is God preparing your children for a future of service to Him? What does God want to do in the lives of your children? End your time by going to Romans 12:1, 2 and discuss the call of God on the hearts, minds and bodies of your children. Pray together and ask the Lord to help them have the faith of Moses and be able to stand against the “wisdom” of the world and stand up for the truths of the Bible. How could you use this passage to help someone understand the sanctity of human life? What were the attitudes about life in Egypt at this time? Was Jochabed wrong to preserve Moses’s life even though the law of Egypt said to kill him? Why or why not? What light does Hebrews 11:23 shed? Why is ending the life of an unborn child so wrong? Back up your answers with more than one Scripture reference. What character qualities do you see in Moses at this point? What will stand him in good stead for the future and which ones will get him into trouble? What qualities do you have that are useful to God and how might He want you to use these in the future? What qualities do you have that get you into trouble? How can God use your mistakes to help train you for your future service for Him?